In crushing rolls, two or more counter rotating heavy steel cylinders revolve towards each other, so particles of feed are nipped and pulled through. Compressive forces operate on the nipped particles causing the size reduction. 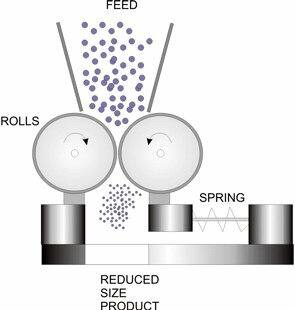 In some designs, a differential speed between rolls is maintained to exert also shearing forces on the particles as well. The roller surface can be smooth or can carry breaker bars, corrugations, teeth, as a device to increase friction and facilitate the trapping of particles between the rolls. Toothed-roll crushers can work in pairs, like the smooth-roll crushers, or with only one roll working against a stationary curved breaker plate. Toothed-roll crushers are much more versatile than smooth-roll crushers, but they have the limitation that they cannot handle very hard solids. They operate by a combination of compression, impact, and shear forces and not by compression alone, as smooth-roll crushers do. A hammer mill contains a high-speed rotor rotating inside a cylindrical case and carrying a collar bearing a number of hammers around its periphery. With their rotating action, the hammers swing through a circular path inside the casing which contains a hardened breaker plate. 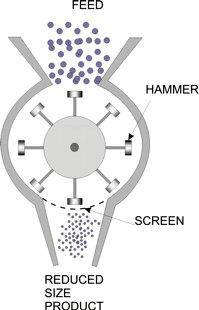 Feed passes into the action zone with the hammers driving the material against the breaker plate and forcing it to pass through a bottom mounted screen by gravity when the particles attain a proper size. Reduction is mainly due to impact forces: however, in choke feeding conditions, also attrition forces can play a major role in size reduction. The hammers may be replaced by knives or other devices to give the mill more flexibility introducing the possibility of handling tough, ductile or fibrous materials. The hammer mill is a versatile piece of equipment that gives high reduction ratios and may handle a wide variety of materials from hard and abrasive to fibrous and sticky. In the food industry there are several hammer mills applications, with extensive use for grinding dry fruits and vegetables, spices, dried milk, sugar agglomerate, cocoa press cake, and extracted bones. These types of mills make use of shear forces for size reduction, mainly in the fine size range of particles. There are several basic designs of attrition mills. The single disc mill has a high speed rotating grooved disc leaving a narrow gap with its fixed casing. Depending on feed size and product requirements, the gap can be adjusted, resulting in an intense shearing action on the feed. In the double disc mill, the casing contains two counter rotating discs, giving a higher shear intensity compared with the single disc mill. The pin-disc mill carries pins or pegs on the rotating elements, and in this case, also impact forces play an important role in particle size reduction. The Buhr mill, which is the older type of attrition mill originally used in flour milling and still used in old olive oil production, consists of two circular stones mounted on a vertical axis. The upper stone is normally fixed and has a feed entry port, while the lower stone rotates. Disc attrition mills have been employed in dry milling of wheat as well as in wet milling of corn for the separation of starch gluten from the hulls. This mills are also used in the breaking of cocoa kernels and preparation of cocoa powder, manufacture of chocolate, production of fish meal, and also grinding of peppers, sugar, roasted nuts, nutmeg, cloves, etc. A tumbling mill is used in many industries for fine grinding. It consists of a horizontal slow speed rotating cylinder partially filled with either metallic balls or rods. The cylinder shell is usually made of steel, lined with carbon-steel plate, porcelain, silica rock, or rubber. The balls are normally made of steel or flint stones, while the rods are usually manufactured from high carbon steel. The reduction mechanism is the following: the grinding medium is lifted up the sides of the cylinder and dropped onto the material being comminuted as the cylinder rotates, filling the void spaces between the medium. A combination of impact and shearing forces brings about a very effective size reduction. The grinding medium components also tumble over each other, exerting a shearing action on the feed material. the temperature sensitivity of the feed. One of the major factors influencing the choice and design of size reduction machines is the hardness of the material to be processed. Hardness is defined in accordance with Mohs’ scale, which is divided into 10 grades of hardness. Roughly speaking, in Mohs’ scale any material is considered soft when its value is between 1 and 3, medium-hard if presenting a value between 3.5 and 5, and hard when the value is between 5 and 10. Many food materials, especially when dry, are brittle and fragile with hardness in the Mohs’ scale in the range of 1–2. According to Mohs’ classification, most solid foods of common use in the food industry can be processed by using ball mills, hammer mills, roller mills, and attrition mills . The knowledge of the mechanical structure and properties of the feed material is important to determine the most suitable force to be used in its size reduction. If food materials are brittle and fragile, then compressive forces may be employed. Other food materials having a fibrous structure are not easily broken by compressive or impact forces, and shredding or cutting knives may be required. As an example, roasted beans require a cutting rather than a crushing action to provide a ground coffee with particles of suitable size and shape. In the case of friable or crystalline structure material, fracture may occur easily along cleavage planes, with larger particles fracturing more easily than smaller ones. In these cases, the use of compressive forces is recommended. When only a few cleavage planes are present, and new crack tips need to be initiated, impact and shear forces may be more useful. Moisture can be either beneficial or inconvenient in comminution processes. Safety problems caused by explosive dust formation (like in wheat flour), arising during the dry milling of many solid materials are well known. In such cases the presence of small quantities of water can be useful in the suppression of dust and, in applications where the presence of moisture is acceptable, water sprays are used to reduce dust formation. Some other applications allow for large quantities of water to be introduced in the size reduction process (i.e. wet milling of corn). On the contrary, in many cases feed moisture content in excess of 2–3% can lead to clogging of the mill with a consequent effect on throughput and efficiency. Moisture can also cause agglomeration, an undesirable effect when a free flowing powder is needed to control feed rate. As previously mentioned, in comminution a lot of energy is dissipated as thermal effects. A considerable rise in temperature of the material being processed is caused by the excessive friction presented in most size reduction machines. Since food materials are normally heat sensitive, serious degradation reactions can occur, and the release of sticky substances caused by the heat rise may also pose a problem. For example, in the grinding of sugar (Niediek, E.A. (1971). Studies on crushing of crystal sugar. Z. Zuckerindus. 21(9): 432–439), the energy released during fracture along fault lines causes each time a new breaking surface to be formed which experiences for a short period (less than a microsecond) a surface temperature in the range of 1,000–2,000˚C. This causes the surfaces to pass the glass transition temperature and become amorphous. In the amorphous phase, the sugar layer is hygroscopic until the sugar in these regions can recrystallize by the formation of liquid and solid bridges through caking. For these reasons, some crushing and grinding machinery is equipped with cooling devices such as jackets and coils.